The Canadian Women’s Hockey League will close this May, the league released in a statement on Sunday. Founded in 2007, the league will fold on May 1, according the the league’s announcement. The league officially release that CWHL (Canadian Women’s Hockey League)’s The Board of Directors has decided to cease operations effectively on May 1 2019. They have justified that business model is economically unsustainable except for the on-ice hockey. The league consists of six teams including four in Canada (Calgary, Toronto, Markham, Montreal), one in Worcester, Mass and another in China. The final Clarkson Cup attracted 175,000 television viewers after striking a final-hour deal to air the game on NHL Network last week. 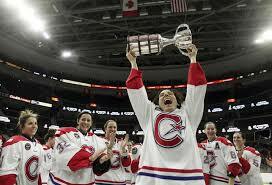 The Calgary Inferno defeated Les Canadiennes de Montreal with the score of 5 to 2 and won the Clarkson Cup. The CWHL has created some of the world’s best female hockey players namely most notably American star Hilary Knight and Canadian star Marie-Philip Poulin, whom both played for Les Canadiennes. The league started paying its players in 2017, though the highest salary in the league last season was just 10,000 Canadian dollars. It was rumored that the league, which does not sell sportswear or disclose attendance figures, had been recently running low on cash. Those rumors have been confirm by Sunday’s news . It is said that the CWHL ceasement will bring a merger with the National Women’s Hockey League – an American-based league founded in 2015 — but there is no plans for a merger as of right now. Several CWHL players found out about the news when the general public did on Sunday and peeped out a uniform statement on twitter regarding the news. They informed that the CWHL would be folding. The players would do their best to find a solution to keep continuing the hockey season but the result could be pessimistic. A major aim of the CWHL was to help increase the game for women and it undoubtedly fulfill its focus over the past dozen years. Unfortunately, its recent financial problems will leave over 100 players who are finding for a new home to continue their hocky enthusiasm.